media - says Yolande - were not talking about it, and even when they did they gave misinformation or partial, to protect those who commanded the genocide”. Uganda has known the ethnic division only through European colonialism. The three ethnic groups, Hutu, Tutsi and Twa, in the Rwandan legend, were nothing else but three brothers who used to live peacefully together. The colonialism has deliberately created divisions, defending the Hutu and revealing, through an out-and-out manifesto of the race, the malignancy of the Tutsi ethnicity: "At school we were two Tutsi girls - Yolande says - and they used us to show the physical differences with the rest of our comrades. It was natural for them to hate us. The genocide began first of all with our education”. And so in 1994, during 100 days, a murderous rage is sweeping the country. One Million people, or as Yolande says: "A life for a million times." Without distinction, the Tutsis were killed by friends and acquaintances turned in executioners without mercy. Yolande was saved for an absurd twist of fate, hidden for three months in the house of a Hutu woman, wearing clothes taken from a cadaver. Between her hands, her happy life had slipped away like sand: "I could understand the value of life only knowing death. Ever since a strong push inside me told me to be witness of what happened, a messenger of life, especially among young people. Yolande is now the mother of 21 orphans, adopted after the genocide, she is the author of some texts that narrate her story but also that of those who escaped and those who killed "Interviewing the butchers for my book, I wonder how they are first of all victims of their own hate." Yolande is not afraid to go back where the murderers of her family walk free on the street:"Why should I be afraid? Even in Europe the authors of the genocide go around quiet. And if I risk to die to give a sign of peace, welcome. I realize that there can be no forgiveness without justice, no justice without humanity”. immense weight of memory: "In Rwanda there isn’t a day without sunshine, maybe that is why we learn to show smile even when we want to scream in pain”. 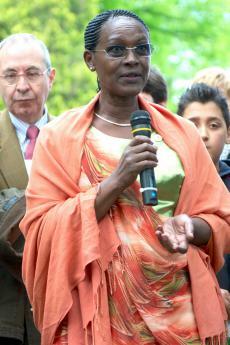 After the genocide Yolande took refuge in Belgium where, in 1999, achieved the citizenship. Here she began her work as a writer and activist trying to bring the international attention on the tragedy that affected and continues to plague Rwanda. Yolande brought her testimony around the world guest of governments, institutions, associations, universities, schools. She has been also invited by the Italian Parliament and participated at the 6th World Summit of Nobel Prizes for peace in Rome, from 24/11/2005 to 26/11/2005. A characteristic of the Rwandan Genocide is the brief amount of time in which it took place, one million deaths in 100 days, it was preceded by an genocidal intention and planning that only some people understood and denounced, like Antonia Locatelli and André Sibomana. Particularly serious are the institutional responsibilities of the UN, that recognized the genocidal actions but responded to them late. Those who in this contemporary context knew to respond with actions to help, rescue, and supportive attitudes are much more worthy of consideration and respect, as they disconnected themselves from a crowd of people that, being directly involved, did not know or want to act and react.